This is a series of letterboxes hidden in some of the best county parks in the nation - the Milwaukee County Parks! (Don't let the snowy pictures scare you off. The parks are great at any time of year!) The series of nine stamps fit together like a puzzle to make a larger 4" x 6" picture. The clues are given in the same order you should find the letterboxes to fit the puzzle together. You may find the letterboxes in another order, but you must be careful to fit the stamps together more carefully. The picture below shows how the stamps fit together and where each stamp is to be found. You might lightly trace the puzzle outline into your stamp book to help you place the stamps correctly. Addresses for the parks are given so you can locate them using Map Quest. Enjoy! Time: 30 minutes. Terrain: Easy. Brown Deer Park is located on the northeast side of Milwaukee at 7835 N. Green Bay Rd. The park is most famous for the Greater Milwaukee Open - a part of the PGA tour played on the golf course at the park. The pond in the park is also a great place for ice skating in the winter and for pedal boats in the summer. Fishing in the pond and cross country skiing are also great activities to do at the park. As you enter the park, follow the signs pointing you to the Boathouse. Take the one-way circle drive that leads to the Boathouse and park in one of the parking spaces located on this drive past the Boathouse. Go to the terrace behind the Boathouse and sit on the bench that has you look out over a large open field (which is a great place for flying kites). Sitting in the middle of that bench, locate the large tree at the edge of the woods across the field at a bearing of 82 degrees. Walk across the field towards that tree, and stop before the bush in front of the large tree. Along the edge of the woods, walk 34 paces north to a path that leads into the woods. Take this path into the woods and it shortly comes to a "T". Take the left path across the bridge (which is much sturdier than the fallen tree I used to cross the creek when I was young and promptly lost my balance and got completely drenched : ) ). Stay on this major trail as it heads north for a while then bends towards the east. Soon after heading east, you will come to a fork in the trail where a large tree has fallen towards the trail on the right. Take 12 paces down the right fork and turn right. Directly in front of you (about 10 paces) is a large tree standing a short distance before the trunk of the large tree that has fallen over. Go to this large standing tree and you'll notice a large opening in its side. Reach inside to the left to find the letterbox hidden in a small crevice inside the trunk. This stamp goes in the upper right corner of the fuller 4" x 6" picture so be sure to give yourself room in your stamp book. After stamping up, return the box into the crevice in the tree. Time: 75 minutes. Terrain: Easy with some steep hills. 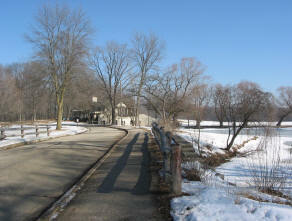 Estabrook Park is located on the east side of Milwaukee at 4400 N. Estabrook Dr. 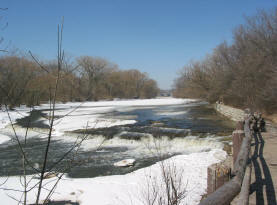 The Milwaukee River flows along the west side of the park over dams and rapids. A nature trail follows NW along the more scenic parts of the river starting at the bottom of the steps behind the building near the parking lot were you begin your search for the two letterboxes located in this park. Enter the park from its north (Hampton Ave.) entrance and park in the parking lot for Picnic Area #5. Park on the south end of the lot. Head south along the park road to the railroad crossing. Follow the railroad tracks west towards the river (no need to worry about trains coming!). Soon you will see why you do not need to worry about trains heading this way. Go down to where a train would end up if one DID go this way without stopping. Take the trail leading to the southeast along the river. Stay on this trail along the river for quite awhile. You will shortly get to a clearing with some steps leading up. Don't take the stairs. Rather, continue on the trail along the river next to a stone wall. Soon you will go up some stairs to another set of stairs that lead all the way up. Again, stay on the trail along the river by taking the stairs in front of you that lead back down. (You might notice some ladders made out of some tree branches along the way. I believe these were placed by mountain bikers to circumvent some of the trail hazards they would face.) Eventually you will pass over a 2 foot diameter pipe sticking out of the ground towards the river. About 15 feet of it will be sticking out of the ground on your right. Standing on the path directly above where the pipe would pass underneath you, take a bearing of 110 degrees. Site a tree up the embankment on that heading with a large number of gnarled roots exposed. The box used to be under that tree, but it disappeared. Aren't you lucky you don't have to go up there anymore! Continue south on the trail. After hiking awhile further, you will pass a fenced-in area where some of the cables holding up the radio/TV tower are anchored into the ground. Watch your head! Don't get hit by the cables! From underneath the cables, count 48 paces farther down the trail. There, there will be a large tree on your left, with one of its many large trunks fallen to the ground at a heading of 30 degrees. The trunk is still attached to the tree at its base. In the hole formed underneath this fallen trunk where it has bent over, you should find the box behind a large piece of loose cork/wood. This stamp fits under the Brown Deer stamp. After stamping up, replace the box making sure it cannot be seen from either side! The trail splits between the two large trees here. Take the left path that quickly goes out to an open area (careful - this may be an archery range). To the east, atop the hill, is a stone building. Go to the other side of this building and find the green electrical box on the ground. From the electrical box, head east to the bike path sign (about 50 yards). Follow the Oak Leaf Trail up to a "T" in the asphalt path and turn north (left). Take the path north until it turns from asphalt to a dirt trail through the woods. Continue on the dirt trail until you get to the first white fiber-optic pole. Behind (east of) this pole and to the right down a small embankment, find a five trunked tree. To the south of that tree (about 4 feet away) is a tree with a small ditch at its back base. (If you walk between these two trees, you'll end up in the small ditch.) In the ditch, you should find a metal railroad plate under some loose tree bark. Under the plate is an old sewer pipe opening that the letterbox is tucked into. The stamp goes directly below the last stamp. After stamping up, be sure to replace the metal plate and tree bark to hide the box. Return to the white pole and head directly west from the pole to the second set of railroad tracks. Follow these tracks south then as they curve west. They will lead back to the parking lot. 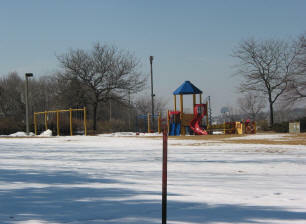 Grant Park is located on the southeast side of Milwaukee County at 100 E. Hawthorne Ave. in the city of South Milwaukee. 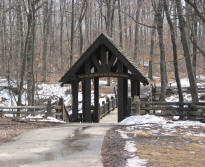 The "Seven Bridges" trail is located in this park, and worth viewing if you have the time. The trial is located just to the north of where you park for the letterbox. The park also has a very nice golf course and both bluffs overlooking the lake and a nice beach. I have always enjoyed the curvy route the bike path takes though the parks on the southeast side - much like a roller coaster at times! Park in the parking area for the Tennis Courts (was Parking Area 3). On the northeast end of the lot, the Oak Leaf Trail crosses the road. Walk on this asphalt bike path east towards the lake. After a little while, the path will curve to the right up a small hill. Near the top of the hill is a wide opening to the left that one could take a few yards to a cliff edge overlooking the lake. Stay on the asphalt trail and as you begin to go slightly downhill you should find a triangle of large rocks - two on your left and one on your right. Stand on the rock to the right and take a bearing of 273 degrees. On that heading, about 60 paces away, you should be able to spot (maybe lean a little left to see around the tree ahead of you) the remains of a large "Y" tree. As you head over in that direction, you'll find that one of the large branches of the "Y" has fallen. Follow this branch (more like a trunk it is so large!) back to the tree from whence it came. The letterbox is now hidden in the "V" of that tree under a large chuck of wood and leaves. This stamp goes under the second Estabrook Park stamp to complete the right side of the larger picture. After stamping up, be sure to replace the box with the big piece of wood on top of it. Mitchell Park is located in the middle of Milwaukee at 524 S. Layton Blvd. 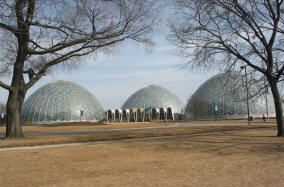 The park is home of the Domes - a unique indoor botanical gardens featuring a desert dome and a tropical rainforest dome. The third dome changes by season. The Domes are worth a visit if you have the time. The rest of the park is divided between nicely landscaped orchards and trees, places for the homeless to camp, and a place for the garbage to blow to from the nearby dumps - a strange mixture of the best and worst of nature. These clues may be a little trickier as you will have to do some triangulation . . .
1) The Miller sign is off in the distance at 312 degrees. 2) A yellow water tower is off in the distance at 155 degrees. 3) A triangular rock is off in the distance at 34 degrees. Note: "Off in the distance" could be a few yards to a few miles. Once you have located this spot, you need to carefully walk 150 paces at 246 degrees to a corner. Check the bush, near the top, two feet to the left of the corner* for the microbox held in place with velcro in the bush branches. Re-hide well. *Whoops! I re-hid it in the bush right in front of the corner when I checked on it on 12/27/06. If you move it to the left bush let me know! Time: 45 minutes. Terrain: Easy with some hills. Doyne Park is also in the center of Milwaukee north of Miller Park and west of the Miller Brewery at 5316 W. Wells St. (Stop for a Brewers game or brewery tour if you have time!) Doyne Park was our hangout back in high school. About its only feature is a nine hole par-3 golf course, but we enjoyed it for the old swings, the hill in the middle of the park, and the sights and sounds coming down the river valley at night. To get to the parking lot, you must take the driveway into the park located at about 53rd and Wells. The park itself is hidden by the houses that surround it. Park in the lot near the basketball court. Cross the basketball court and go to the swings. Take time to enjoy the swings and reminisce about earlier times when swings were bigger and taller, more fun, and less safe. Continue on the asphalt path heading east as it goes along the backyards of the houses. As you go parallel to the soccer field, look across the field to the hill in the middle of the golf course. Imagine lying on the top of the hill on a warm summer night staring up at the stars with Culture Club, Duran Duran, and other great 80s music playing on a small boom box, or listening to the sounds of baseball or Summerfest coming down the valley. Stay on the asphalt trail as it goes between the church/school and east soccer goal. (You might stop and pay tribute to the old swing set that used to stand where the soccer goal is now by dancing to "I'll Tumble 4 U" by Culture Club.) Continue on the path as it heads towards the east end of the park. Before you reach the end of the path at Wells Street, there is a grove of trees that sticks out from a chain-link fence on the left of the path. A solitary tree stands in a small clearing before you get to the grove. Head towards the solitary tree and then to the fence behind it. You should find a path that heads downhill to the north along the fence. Follow on the trail until the fence ends, then head left (west) away from the bridge and towards the trail that goes west along the river. Continue west along the river trail over a concrete wash basin. Eventually you'll begin to see a stone fence and numerous concrete slabs on your left up the embankment as the path gets closer to the river. Walking on the path along the river, you'll soon see two brown poles sticking up out of the ground perpendicular to the river, with a gray pole sticking up on the left of the trail. Count off 48 paces from the brown poles heading west on the trail past a bridge across the river (don't cross the bridge). On the 48th step, stop and face left. Just above the rock wall is a tree whose trunk makes a wide V stretching out towards you. The letterbox is hidden in the hole in the rocks at the base of the tree. You'll have to remove the black asphalt rock piece that holds the letterbox in place. This stamp goes right above the Mitchell Park stamp. After stamping up, replace the letterbox (upside-down so it doesn't collect water) under the tree with the rock holding it in place and continue west on the trail. When you come upon another chain-link fence with a gate, turn left and go up the slight hill. Continue straight and find your car. Time: 60 minutes. Terrain: Easy with some hills. Underwood Creek Parkway is located on the west-central side of Milwaukee at 9800 W. Underwood Creek Parkway. This rather large park has a nice 18-hole par-3 golf course, nice tennis courts, lots of forest trails, great places to run, and great places for watching trains. You might (carefully) place a few pennies on the railroad tracks near the 10th hole. By the time you return, they most likely will be "squished"! From Doyne Park, get onto I-94 west and take Hwy 41/45 north. Take the Watertown Plank Rd/Swan Bvld. exit. Head on Swan Bvld. as it makes an "S" curve. Before the train bridge is the entrance to the Underwood Creek Parkway. Park near the tennis courts and golf clubhouse. Near the golf clubhouse, find the 10th tee and note how long the hole is (and marvel at the shortest regulation golf hole I know of!). Walk over to the 1st tee and find how long this hole is (much more reasonable). Double the 1st hole distance then subtract the 10th hole distance as you walk over to the Old Duffers Xing sign. From the sign, take a bearing that is the result of the calculation. On that heading, through the trees (which you'll have to go around) is the archery range. Go to the archery range (carefully!) and find the line of trees and brush that make up its west border. Go through the opening to the other side of this line of trees and bushes. There you should find a large path leading south into the woods. Continue on this large path south until it ends at a "T". Turn right and continue on the trail west. This trail will split near a chain link fence. At the split take the right path toward the yellow covered wire, then take the next left. After a few paces, you'll come to a place where handicapped vans can stay for only a little while. On the opposite side of the building find the fire pit and then the yellow pole behind it. (Note: Area under construction and it has changed the landmarks for these clues. Until they are done, I hope you can figure out the correct way!) From the yellow pole, walk 17 paces going northeast. 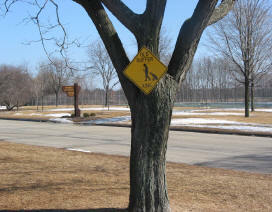 On your left you should find a small "deer" path heading into the prairie. Take that trail as it goes along a noisy road. It will soon go downhill and end at a quiet road (try to stay near and parallel to the noisy road as you follow along this path with its many branches). Take the quiet road south under the noisy road and go up to the stone building you should see. On the back side of this building is another trail leading down into the woods. Walk on this trail as is goes down into a gully (hopefully it won't be wet) and then back up a hill. Continue on the trail heading south. Forty paces from the end of the trail there is a large tree on the left (east) side of the trail. Behind it and to the right is another large tree. Behind both of these trees is another large tree with a slightly smaller tree growing right next to it. The letterbox is in a hole in the base of the slightly smaller tree. First poke a stick in the hole to check for creatures, then reach in deep to pull out the box. This stamp goes to the left of the Brown Deer Park stamp along the top middle of the larger picture. After stamping up, replace the letterbox in its hole. At the end of the trail you can sight the park road which you can take north back to your car. The Currie Golf Course is located north of the Underwood Creek Parkway on the west side of Milwaukee at 3535 N. Mayfair Rd. Its only feature is a pretty good golf course located on the grounds of Milwaukee's first airport. The golf course has an inflatable dome to make a wintertime golf range. North of the park entrance, the Menomonee River Parkway winds its way north along the Menomonee River for a beautiful view. Heading north on Hwy 100 (Mayfair Rd.) do not take the Currie Park golf entrance, but take the Menomonee River Parkway entrance which is another block north. Take the parkway west then north as it passes under Capitol Drive. The parkway ends at the corner of Congress St. and the Parkway. Park at this corner. Take the asphalt bike path north from the corner. After a while of walking through the woods, you will walk under the overpass where the original box was placed (but was destroyed by construction). Continue on the path as it curves right and then under another overpass. On the other side of the overpass, you will quickly come to a "U" turn in the path. Find the green electrical box inside the U-turn of the bike path there. Take 50 paces down the bike path from the electrical box (completing the "U" turn). There on your right is a fallen tree that is perpendicular to the path about 10 paces off the path. On the end facing you, pull out the piece of wood to expose the new temporary hiding location of the box. This stamp goes to the left of the Hanson Park stamp, completing the top of the larger picture. Carefully replace the letterbox and backtrack to your car. 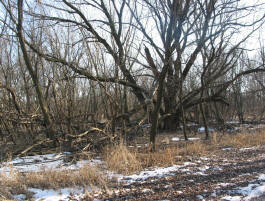 Dretzka Park is located on Milwaukee's northwest side at 12020 W, Bradley Rd. It features a pretty good 18-hole golf course, an old ski/toboggan hill, and lots of picnic areas. It is also the location for a number of high school and college cross country invitationals. Enter the park from its 124th Street entrance and park in the north parking lot (at Picnic Area 1 north of Picnic Area 2). Find the sign board for a different type of golf. Take the asphalt path north away from the sign board. After a short walk you will come to a range. As you walk to the east side of the building that is there, find the number on the first sign out in the range. Standing on the east side of the building, next to the sign declaring something prohibited subtract 15 from this number and take a bearing at that amount. Site a path up the hill on that bearing that leads to an opening in the trees at the top. Take that path through the opening, and follow the trail as it cuts lengthwise along the top of the hill. Halfway across you will come upon a shed and some of the old blue ski-lift poles. 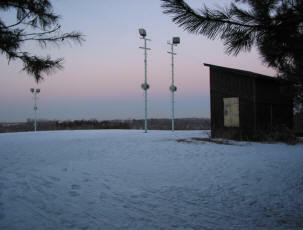 You are atop the ski/toboggan hill (and on hill #1 of the high school CC course). Continue on the path down the other side of the hill. At the bottom, turn right (south). Keep walking south with the asphalt service road to your left. When the service road turns east, continue walking south with the woods on your left. Continue on the path between the woods and the evergreens and then straight south through the evergreens until you come to the park road. Cross the road continuing south. Continue to keep the woods on your left. After a short while the woods "humps" out towards the road. Around the "hump" there will be a distinct path into the woods. Take this path east and then as it bends south up and then down a hill (imagine running these hills in a cross country race). Soon you'll exit the woods. Continue south keeping the woods to your left. Eventually you'll come to a point where the woods on your left makes a distinct turn to the west. Find the sole tree on your right in the corner that is made at this bend. With your back to the tree and facing south, take a bearing of 140 degrees. Ten steps into the woods on that bearing is a three-trunked tree with a fallen tree nearby, with the root end of the fallen tree nearest you. The box is under the roots, hidden by sticks and leaves, on the south side where the trunk meets the roots. Please re-hide with leaf and stick cover, making it look natural. This stamp goes between the Currie Park and Doyne Park stamp to complete the larger picture. After stamping up, return the box to its hiding place and cover it with brush again. Thank you for completing the Oak Leaf Trail/MCP Letterbox series!